The music of the „ch’tis“ – great art! The French magazine Classica thinks in his edition of July/August, the programme of the CD of the Orchestre de Douai – Hauts de France is very „ch’ti“. This refers to the binding tie for this recording, the two great composers of nothern France, Lalo and Roussel. 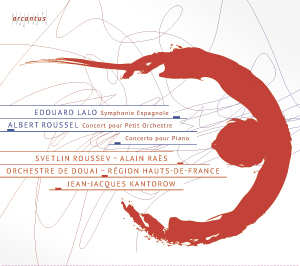 Apart from the admiration for the two soloists of the CD, it mentions the perfect collaboration with the conductor Jean-Jacques Kantorow – and last but not least, it points out the quality of the orchestra of that region. Also Radio France reviews the recording in its almost two hours programme „En pistes!“ – the violinist Svetlin Roussev and the pianist Alain Raës are as well estimated in France as the conductor Jean-Jacques Kantorow.